Pot Pies and Egg Money: Finally, turkey eggs are being incubated; hooray for surrogate moms! Finally, turkey eggs are being incubated; hooray for surrogate moms! 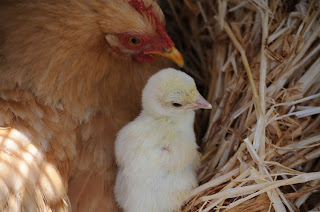 Cochin banty hen with 1-day-old Midget White turk. 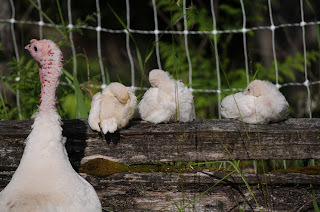 This year, for some reason our Midget White turkeys started laying eggs about a month later than usual, around mid-March. After losing two of our four breeding hens recently, we have been keeping close tabs on the surviving two and collecting their eggs. At this point, we have three broody chickens sitting on turkey eggs, and we just put one of the turkey hens on a clutch. We're still getting an egg almost every day from the remaining turkey hen, so we will save them up for a few days and then put her in a turkey brooder with her own clutch. One of the many things we've learned in the course of breeding birds is that hatching eggs are dormant for about 6 days. This allows the hen to accumulate a clutch of eggs (since she doesn't lay more than one egg per day) before the actual incubation begins. Without this period of dormancy, the eggs would all hatch on different days. Our Midget White hens typically incubate between 12 and 18 eggs at a time, so obviously having them all hatch more or less on the same day is a good thing! There are sometimes late arrivals among the hatchlings, which may get left behind if the hen and other babies have already left the nest. Cochin banty hen with Midget White turks. One of our broody hens is a Cochin banty. The poor thing, all she wants to do in life is incubate eggs and raise babies. Because of her banty-esque size, she can only comfortably incubate 4 or 5 turkey eggs at a time, but I feel sorry for her when she's this broody, so I have her sitting on 4 of them. 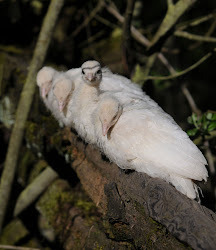 She successfully hatched and raised baby turks last year, too (see photo above). Of course, in years when we've had more Midget White hens than we do right now, they have done a great job. They readily go broody, lay and incubate plenty of eggs, and are attentive and protective mothers. 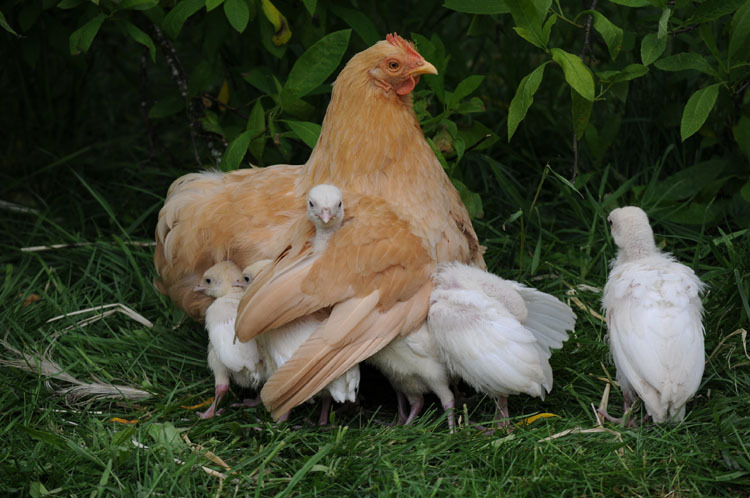 Midget White hen with some of her brood. Speaking of surrogate mothers, we have discovered that one of the hazards of letting all the birds free-range is that they sometimes lay eggs in some other bird's nest. Usually, when a hen is incubating a clutch of eggs, she hops off the nest for a few minutes every day, at least long enough to eat and drink something. (They also like to poop away from the nest.) 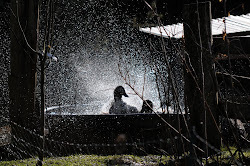 Last year a Blue Swedish duck hatched 2 chicks; this was a little tricky because she was also incubating duck eggs, which incubate for 28 days (chicken eggs incubate for only 21). Fortunately, there was a broody hen available who happily adopted the orphans. Naturally, we called them Donald and Daisy. 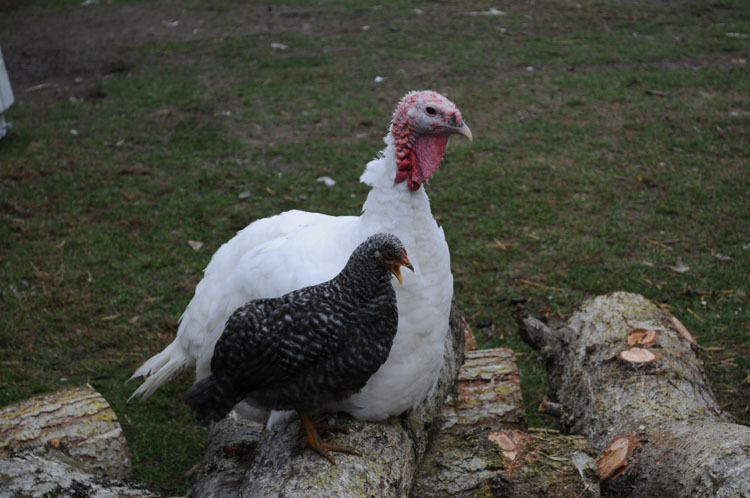 Midget White turkey with Barred Rock pullet she hatched and raised. It's not always easy managing all these birds during breeding season, but we're learning every year and getting better at it. It's nice to know that so many of the hens don't mind sharing the mothering duties; it makes our lives easier, and sure makes for some interesting photos! Great story and wonderful pictures! I love birds. 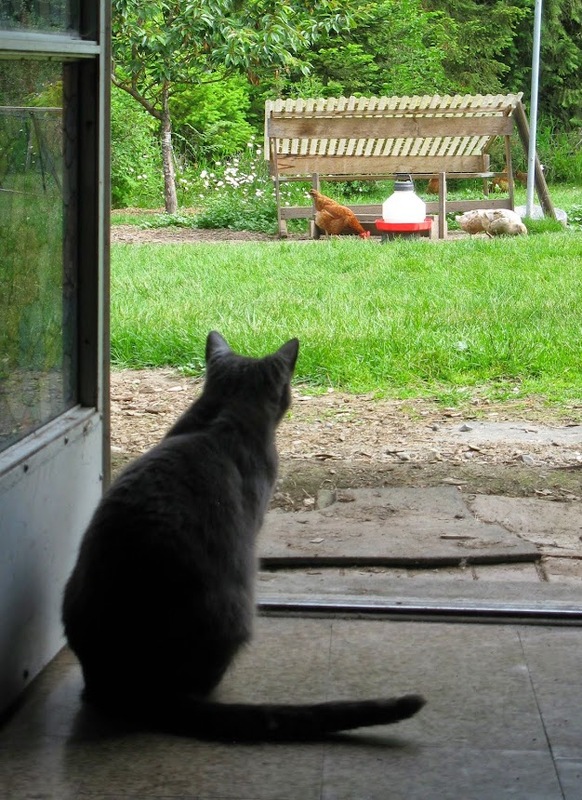 I currently have chickens and pheasants. I am looking forward to starting with midget whites in the spring. I am glad to hear of your positive experiences with them. Thanks for your comment! That's great that you will be getting Midget Whites. What kind of pheasants do you raise? We've kicked around the idea from time to time of getting pheasants, but so far it hasn't really fit into the big picture. I'm interested in your experience, though. I have a pair of Red Golden pheasants. They are still young and not likely to be producing for another year, but maybe in the Spring. They are beautiful and interesting birds. 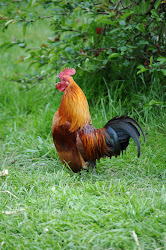 Easy to keep, they do need space and aren't as tame as other common poultry, maybe similar to ducks? They will eat out of my hand but the don't like to be handled. They make great whistling, cooing, chirp sounds. They like fruits and grasses a lot. You can't keep them unconfined though. They need an large aviary. They can't be depended upon to stick around. They aren't that domesticated. I love hanging out in their pen and watching and feeding them. how big is your aviary? I have a couple of books about raising pheasants but for things like this I prefer hearing someone's actual experience. I've seen photos of the Red Goldens and they sure are beautiful. Are you planning to breed them? Also, I don't know if you're in Washington, but do you have to have a special license for pheasants where you are? how could i come across buying some affordable turkey hens is the only question that is stuck on my mind. PLEASE HELP!!!!!!!!!!!!!!!!!!!!!!!!!!!!!!!!!!!!!!!!!!!!!!!!!!!!!!!!!!!!!!!!!!!!!!!!!!!!!!!!!!!!!!!!!!! !